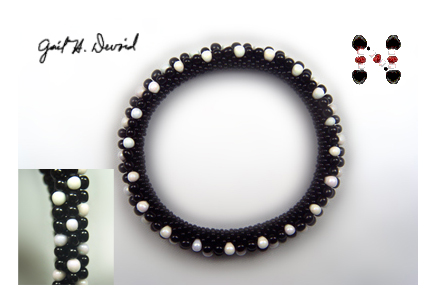 This bracelet uses a bead crochet stitch and 2 colors of Miyuki drops. The instructions are for beginner bead crocheters, with complete illustrated instructions to do an invisible join successfully.This bead crochet pattern uses 3mm Miyuki drops in black and white and 11/0 Czech seed beads. 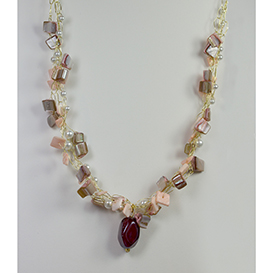 Pattern includes a DB chart and detailed instructions for either an invisible join, or the completion of the bracelet with a clasp. Pictures shows bracelet on its side, and how the drops look when worn. 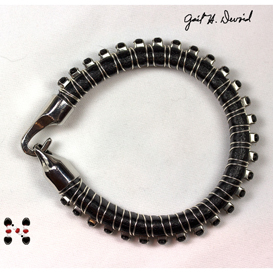 The Czech seed beads are on the underside of the bracelet, making it very comfortable to wear. 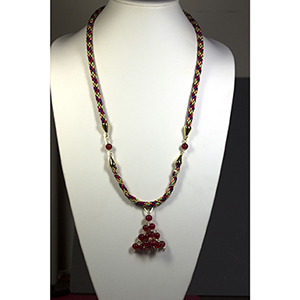 The drops are on the upper side and show the beauty of the Miyuki beads, as well as the diagonal design, when you have the bracelet on your wrist. This shows how the bracelet looks worn. Click on the picture above to enlarge the photograph. Like all slipstitch bead crochet bracelet, you make this bracelet to the measurement of your wrist. To put the bracelet on, you roll the bracelet over your hand. The bracelet stretches as you roll, and then snaps back to your size on your wrist-unless of course you've decided to finish it with your favorite clasp!